In medium bowl, mix flour, baking powder, granulated sugar, brown sugar and cocoa with whisk until thoroughly combined. Add eggs, oil and milk; stir with whisk until smooth. Pour batter evenly into 2 (1-cup) microwavable coffee cups. Microwave on High about 3 minutes or until outsides edges are firm and centers are almost set. Watch to make sure the batter doesn’t overflow (if it looks like it’s about to overflow, stop the microwave until the batter settles back down, then continue to heat). Immediately sprinkle cupcakes with powdered sugar. Serve warm. 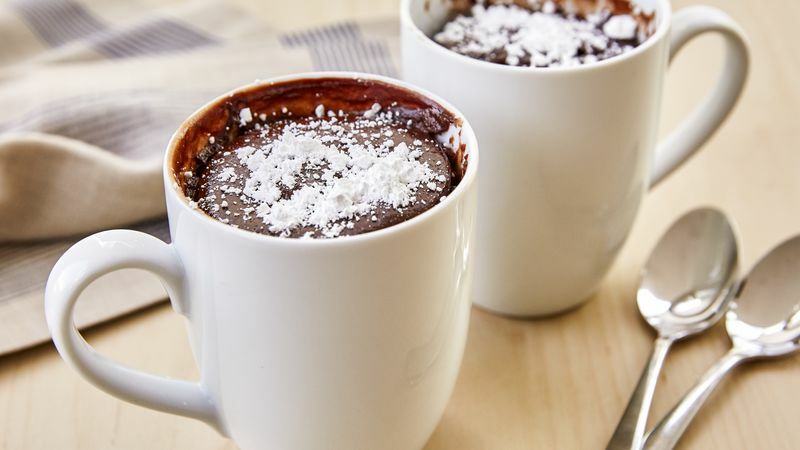 Use high-quality baking cocoa for best results. Top the cupcakes with warm caramel sauce or serve alongside a scoop of vanilla ice cream for extra oomph. Add a few drops of red food color to the batter for an even more fitting Valentine’s Day cupcake.